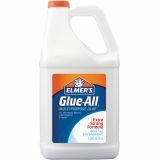 All-purpose, non-toxic white glue dries fast and clear, and won't stain. Bonds wood, paper, cloth, pottery, and all porous materials. 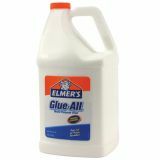 Can be neatly applied to all paper material, spreads smoothly without stringing and will not wrinkle even the thinnest tissue. Excess can be rubbed off quickly and easily. Waterproof and stainless. 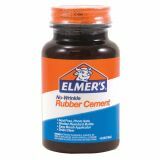 Contains pure crepe rubber. Extremely flammable. 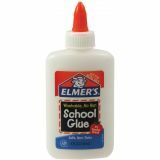 Easy to use, easy to clean-up, Elmer's Glue Sticks are the choice of teachers and kids everywhere! Disappearing Purple formula is easy to see when applying and dries clear. 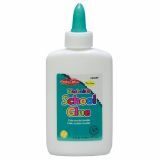 Washes easily off hands and out of clothes. Safe, non-toxic and acid free. 0.24 oz. per stick. 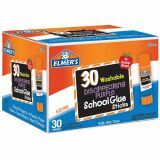 Disappearing Purple 30-pack.